Spider-Man: Turn Off The Dark has finally enjoyed its opening night. A host of celebrities, including Jay-Z, Spike Lee, Vanessa Redgrave, Steve Martin and Matt Damon, attended the long-postponed event. Director Julie Taymor got a huge ovation and chants of "Julie, Julie" as she was welcomed onstage to kisses and hugs from Bono and the Edge - collaborators who'd brought her into the project years ago, but later played a role in her ouster from the 70 million dollar production. Afterwards, at the stage door of the Foxwoods Theatre, cast members were ebullient and relieved. "The biggest lesson I learned from this whole process is never to give up," said Reeve Carney, who plays Peter Parker. "There were many opportunities along the way for many of us to quit, but none of us did." "We were trying to do something that's never been done. And that's very hard to do. And we were right in front of everybody," Julie said on the red carpet. "That's difficult." 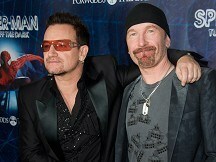 U2 singer Bono admitted about writing the score for a musical: "We found out it's harder than you think" and thanked the audience for its patience. He added: "We had to save Spider-Man, because Spider-Man has to save New York." The show's planned opening was initially set for February last year, but financial issues forced producers to suspend work. Injuries to several cast members also marred the production. Many theatre critics grew impatient and panned the show in reviews that appeared in early February. Producers finally intervened in March, firing Julie and shutting down the show for four weeks to retool. Robbie Williams found he had really Come Undone as he performed on stage with Take That on Tuesday night - when his trousers split. Bruce Springsteen has said his bandmate Clarence Clemons' stroke was serious and he is going to need a lot of help to get back to his former self. Sir Paul McCartney has admitted he unintentionally kicked off a trend for homegrown recording with the release of his first solo album. Janet Jackson blasted her way through a raucous set at a glitzy charity gala inside the Louvre museum in Paris. Lady Gaga has topped the Forbes list of Best Paid Celebrities Under 30 despite recently revealed her Monsters Ball world tour left her bankrupt.